Today, we took another major step forward in localizing our platform to countries around the world with support for 4 additional currencies – the Euro, Japanese yen, Chinese yuan, and British pound. 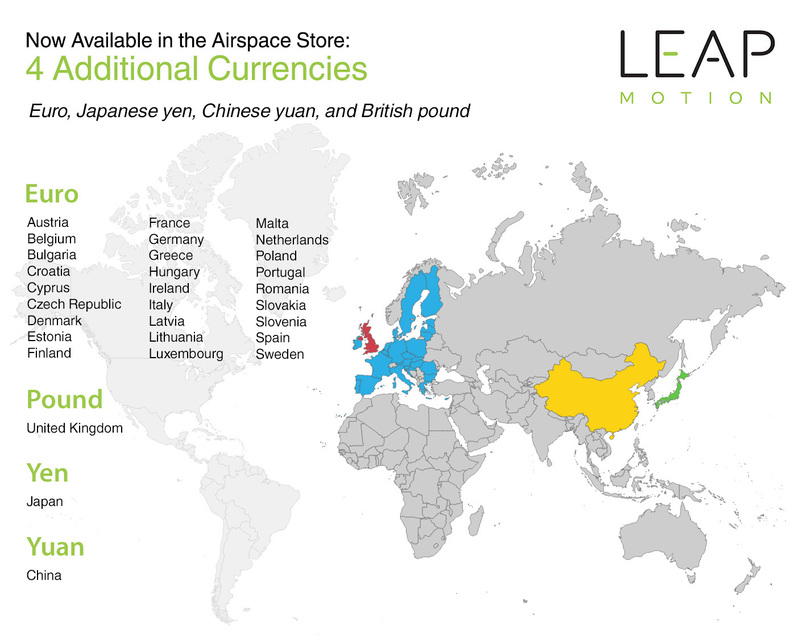 Airspace users in 30 countries (Japan, China, UK, and most of Europe) will see pricing in their local currencies. With this change, they’ll feel more comfortable browsing and shopping for apps in Airspace. As a Leap Motion developer, you’ll continue to select app pricing tiers in USD, and your regular payouts will continue to be based on the USD list price. Airspace consumers will see stable prices that have been set according to a conversion table – available here. In this way, we’ll ensure that fluctuating exchange rates don’t interfere with your payout stream or the Airspace user experience.